Bill Galvan has been a comic book fan since he was 7 years old, and has been drawing comics ever since. As a junior in high school he was awarded a summer scholarship to the Academy of Art in San Francisco. After graduation, he went Southern Utah University, working as an editorial cartoonist and layout designer for the school newspaper, the Thunderbird. He also wrote and drew a weekly comic strip called Thunderbird, featuring a winged superhero of the same name. After graduating with a Bachelors degree in Art/illustration, Bill worked on his own comic book series Thunderbird, a black and white bimonthly comic. In 2003, Bill co-created The Scrapyard Detectives, a full color comic book series for The Diversity Foundation. In 2004, Galvan revived Thunderbird in a full color series, which lasted for 2 issues. Bill currently draws for Archie Comics as a freelance penciler, and has also drawn for Marvel Comics and Bongo Comics. He continues to edit and pencil the non profit all ages series The Scrapyard Detectives for the Diversity Foundation. COC: Can you tell us something about your experiences growing up? BG: I was born in Merced, CA and moved to Tuolumne, CA when I was in 3rd grade. I am the youngest of two brothers and two sisters. I discovered comics at an early age, and around the time that the original Superman movie came out in 1978, I decided I wanted to be a comic book artist. BG: I started drawing when I was about 7 years old. For Christmas in 1978 I got a big Superman book that chronicled his stories from the 1930s to the 1970s, and it was a big influence on me. I was a Superman fan after that, and I read every Superman book I could get my hands on. I also started reading Marvel Comics as well, and I loved being able to tell a story with my artwork. Soon I started drawing my own comics to sell in 4th grade. I created a superhero called the Phantom Avenger, and photocopied off the comics and stapled them together. BG: I really liked Curt Swan, the Superman artist from the 1960s to the 1980s. His style was a big influence on mine, his story telling ability was very clear and concise. BG: Drawing is the thing that I am best at, so it seemed that if I was going to have a career; it would make me the happiest. I also like the idea that as a comic book artist, my artwork could be seen by a large audience. BG: I try to do work that is mostly all ages, and fun. Things that my kids would like to read, that I can share with them. BG: I graduated from Southern Utah University with a degree in Art/Illustration. The illustration classes I took really opened my eyes to the kind of hard work and discipline you need to become a better artist. Plus, being in an environment with other artists always helps, because you learn from each other as well. My art professor at SUU gave me a lot of important instruction on layout and composition that I use to this day. BG: I mostly do pencils for comic book stories. I have painted in acrylics, oils and watercolors in the past, but I’m not that great at it. I do like to digitally paint using the computer, but I don’t do it often enough. Another medium that’s fun is 3D modeling and animation, it takes a lot of time, but it’s always a fun break. COC: What kind of assignments have you worked on? BG: The first comic book series I worked on for a publisher was a superhero comic book called Thunderbird in 1994. After that I was commissioned to do the first issue of The Scrapyard Detectives, and have worked on every issue since 2003. In 2005, I relaunched Thunderbird as a color series this time around for two issues. In 2006 I was hired by Archie Comics and have worked on the regular issues and the digest comics. Recently, my work on the mini-series “Archie: Freshman Year” has been collected in a graphic novel. In 2008 I worked for Bongo Comics on a Radioactive Man story, and then a Bart Simpson story. Also that same year, Marvel Comics asked me draw a story featuring their character, The Sentry. BG: I’d say I’m especially proud of the first cover I did for Archie, which was a Jughead cover I did where he was wearing a rocketpack and flying over a cake. I made a sketch of it and sent it in, which in turn, inspired a story written by George Gladir. BG: I am also a graphic designer for Ultradent Products and the creative director for the Diversity Foundation. I do design work for Ultradent and also edit and draw the Scrapyard Detectives series. BG: It was a great opportunity to have work shown with other artists and to collaborate with my friend Alex Simmons. COC: Since exhibiting the depiction of people of color is an aim of the COC, what part does cultural and/or racial diversity play in your art, and your art assignments? BG: The Scrapyard Detectives is a series that brings together a group of kids from different backgrounds and shows them working together to solve mysteries in their community. 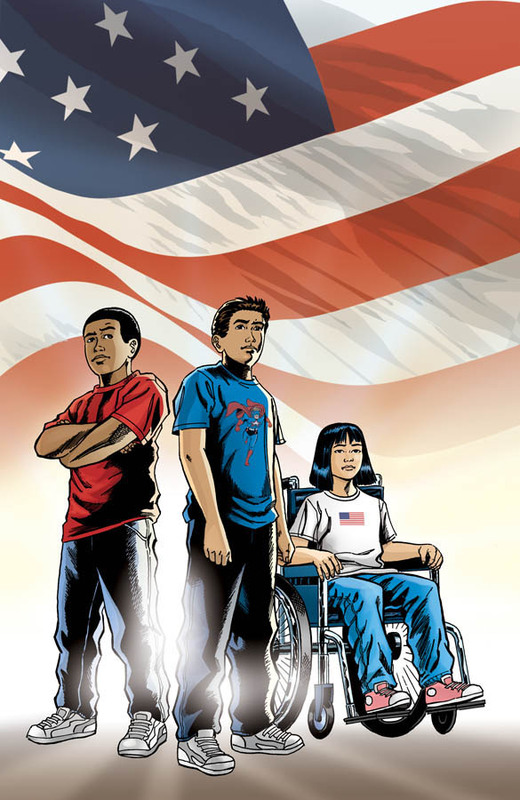 It’s an all ages comic book that shows readers how to look past differences and work together. It seems like a perfect fit for the COC exhibit. BG: Like any artist, there are a lot more characters that I’d love to draw, so I’m constantly looking for opportunities to add to my “collection” of stories that I’ve contributed to. I hope in the future that people will remember my artwork and that I did a good job on the characters and stories that they loved. BG: Draw as much as you can, especially from life. Listen to criticism and take what you can from it to grow as an artist. Technology may have changed, but the basic principles of comic book art, such as layout and storytelling have not. Also, draw stuff that you like- that’s the best way to keep momentum and enthusiasm for your work! BG: Thanks for letting me to be part of the Color of Comics!